Opening Hours: Daily 10am-5pm (Fri & Sun 11am-5pm). Decorated by Robert Smillie Memorial Primary School, Big Red Hen and Tom Binns (Project Manager). 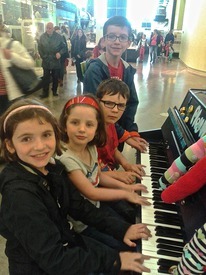 Janice Mills sent us this great photo of her grandchildren playing 'Nemo' in Riverside Museum. Glasgow's very own von Trapp family! The wee man and his Gran playing ' Nemo ' at Riverside. Everything is greener in Glasgow . . . including the couches. Just time for a quick pose outside the Museum before Staff and pupils from Robert Smillie Memorial Primary School visit ' Nemo ' and see their creative efforts in action. My turn now Graeme ! Karen Long playing ' Nemo ' out on the floor at Riverside. Graeme Stokes playing ' Nemo ' at Riverside surrounded by the piano decoration squad from Robert Smillie Memorial Primary School, Larkhall.